Days before the presidential runoff in Egypt, candidate Ahmed Shafiq and the Muslim Brotherhood sharpen their attacks on one another. Days before the presidential runoff in Egypt, presidential candidate Ahmed Shafiq and the Muslim Brotherhood sharpened their attacks on one another on Sunday. 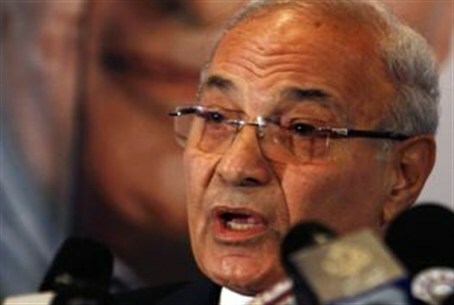 According to a report in the Egypt Independent, Shafiq started the round by accusing the Brotherhood of paying thugs to attack his campaign headquarters in Cairo last month. The runoff presidential election is slated for June 16 and 17 and will pit Shafiq, who was former President Hosni Mubarak’s last prime minister, against Muslim Brotherhood candidate Mohamed Mursi. The Egypt Independent reported that later in the day, the Brotherhood accused Shafiq of telling “huge lies” and said he did nothing to stop a notorious charge on protesters in what has come to be known as the “Battle of the Camel” during the January 2011 uprising. The group said in a statement that Shafiq's lies aim to tarnish the Brotherhood's image and mislead voters so that they either do not vote for Mursi or boycott the runoff altogether. The statement also denounced Shafiq for accusing the Brotherhood of killing demonstrators in the Battle of the Camel, saying it is well-known that Mubarak's now-dissolved National Democratic Party orchestrated the attack in order to thwart the revolution. The incident they referred to took place days before Mubarak stepped down, when men riding camels and horses charged demonstrators in Cairo’s Tahrir Square. “Shafiq was a member of the dissolved [National Democratic] Party and prime minister at the time of this massacre, but did not do anything about it except apologize for it,” the Brotherhood statement said, adding that the revolution would not have succeeded had the Brotherhood not defended Tahrir and its demonstrators during that battle. Shafiq previously hit hard at the Muslim Brotherhood, warning that an Islamist victory will lead to terrorizing Christians and accusing the Brotherhood of trying to make “Palestine" the central issue for Egyptians. In an unusually sharp attack, Shafiq accused the Brotherhood of acting as if “Palestine is the capital of Egypt.” He said that Egyptians face several domestic issues that should not be overshadowed by the status of the Palestinian Authority, whose Hamas faction was founded by the Brotherhood.